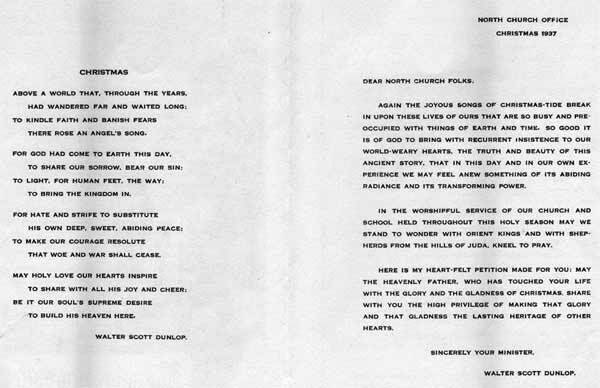 The North Baptist Church was organized on November 15, 1859. The church had been in existence as a mission school for four or five years already. The church building at 2nd and Pearl Streets was dedicated on February 25, 1865, and the church on Linden Street below 4th was first used for public worship on May 29, 1894. During the 1870s, school enrollment in Camden increased rapidly and the Board of education was constantly looking to purchase more land. The 1871-1872 school year began with 4,588 pupils on the register, but the average daily attendance was only 2,762 pupils. The North Baptist Church offered to rent its building to the board for a primary school, provided the Church could use the facility for Sabbath school purposes. The board declined the offer since the rules prohibited using the schools for any other purpose, but secular education. Instead, they purchased three parcels of land. One on Third Street, between Pearl and Elm Streets; a second, on Mount Vernon Street, above Broadway; and a third, at the northeast corner of Third and Walnut Streets. 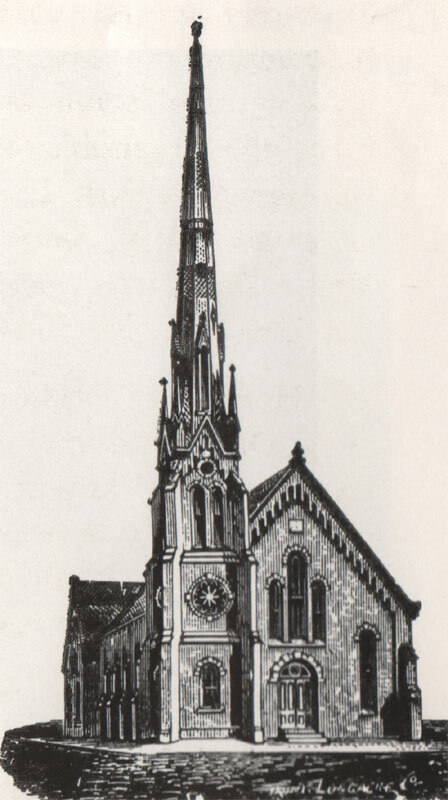 The church building at 2nd & Pearl Street was sold to the newly-organized Calvary Presbyterian Church, a split from the old First Presbyterian Church, in the summer of 1895, for $18,000. Calvary Presbyterian Church occupied this site until June of 1924, when the building was acquired for use in the construction of the Delaware River Bridge, later renamed as the Benjamin Franklin Bridge. This building is still in use as a church today. The building was then the home of the Faith Baptist Church. In 1855 Rev. 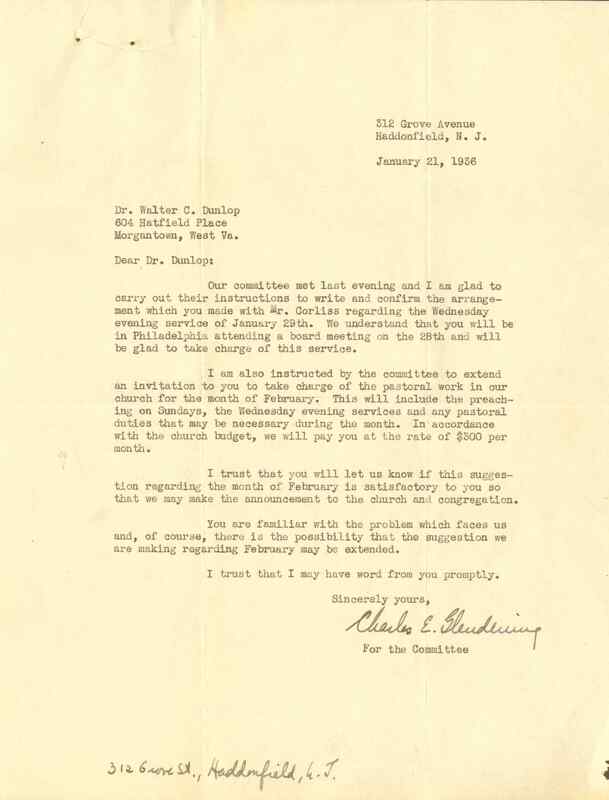 E. V. Glover and Mrs. H. P. Hale, members of the First Baptist Church of Camden, began a series of meetings in private houses remote from the church, de­signed for the benefit of infirm and indifferent members who seldom enjoyed the services of the church. In the search for a suitable place for holding meetings in the vicinity of Coopers Point, a large population was found destitute of both religious and secular instruction. In 1856 an attempt to establish a Sunday school failed for want of a suitable room. In 1857, a large hall in the silk factory on the northwest corner of Front Street and Pearl was offered gratuitously by the proprietor, German Foss, in which to hold a Sunday school. September 7, 1859, an organization was effected by choosing Rev. E. V. Glover, superintendent; Adam Angell, assistant; Henry Samuel, secretary and librarian ; Mrs. H. P. Hale, superintendent of the infant department. 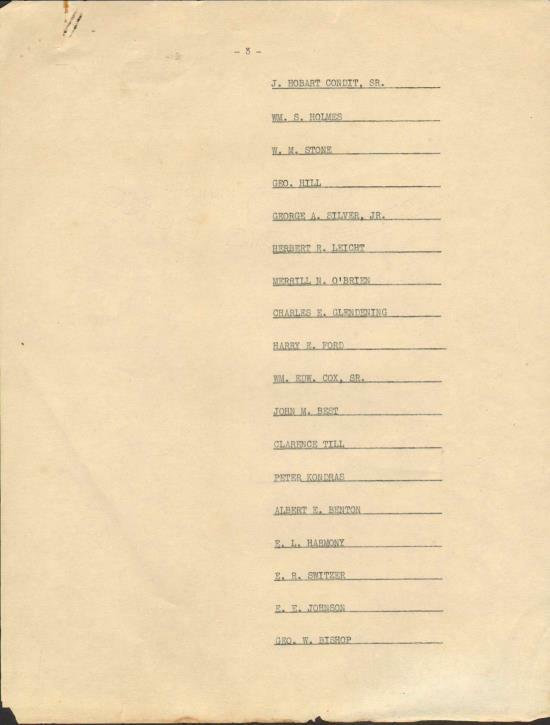 The following were appointed teachers: Joseph Whitman, Mrs. Louisa Hindle, Mrs. Anna Briggs, Miss Louisa Woolston, Mrs. H. Foss and Miss Addie McCully. The school began with eighty-eight scholars. It continued to meet in the silk-factory until January 1859, when it was transferred to the factory of E. W. Williamson, corner of Second Street and Birch, where it was held until July 31, 1859. 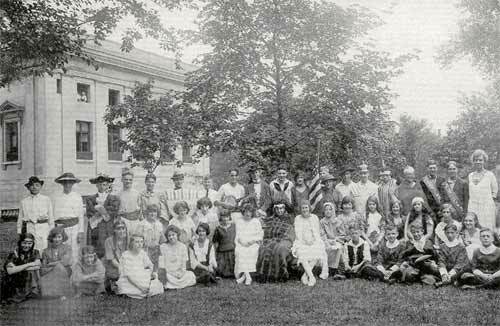 The influence of the school made itself manifest and the number of members rapidly increased. 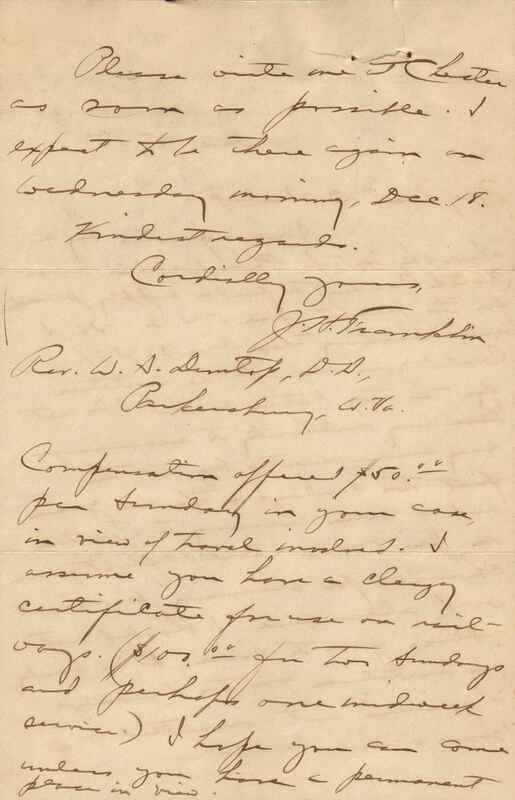 An equally important factor in the new enterprise was the meeting for adults begun on Sunday, October 18, 1857, and continued, on Sunday at the hall and on Tuesday at the residence of Mr. Ellis, on Birch Street, until the removal to the building of Mr. Williamson. The need of larger and permanent quarters had now become so pressing that on January 26, 1859, the First Baptist Church appointed Key. 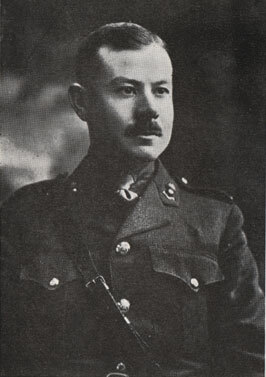 E. V. Glover, J.D. Tustin and J S. Collings to take proper steps to procure a suitable house. Elwood K. Fortiner was afterwards added to the number, and aided greatly in the erection of the new building, which was situated on Elm Street, below Second, and was dedicated July 31, 1859. On the 10th of November 1859, at the house of Rev. 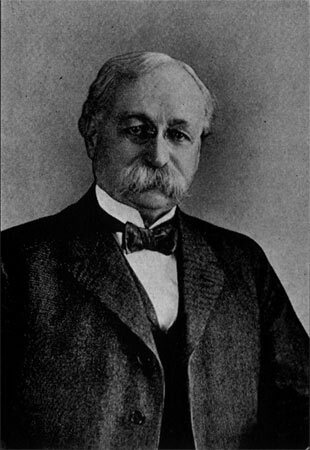 E. V. Glover, a meeting was held, of which Rev. 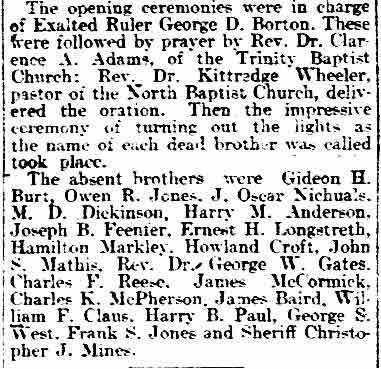 E. V. Glover was chairman and J. D. Tustin clerk, for churches held November 29th, and the services in recognition of the new church were conducted at the First Baptist Church by Revs. G.Q. Ferguson, E. D. Fendall, J. E. Wilson, F. T. Cailhopper and J. Hyatt Smith. Of these original thirty-seven, six are still members. The church began its history with a small body, but with a live root; and this living root, planted in a favorable place, soon showed a vigorous growth. On December 2, 1859, Rev. 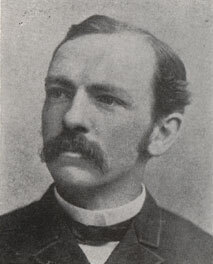 E. S. James, D.D., was called to the pastorate, began January 1,1860, and continued till the last Sunday in 1863, when the church, having decided on the erection of a larger meeting house, and Dr. James feeling his strength unequal to the extra labor involved, resigned, and on January 12, 1864, Rev. S.C. Dare, previously pastor of the church at Cureton, N. J., was chosen. During this pastorate the present church edifice, corner of Second Street and Pearl, was built at a cost of about thirty-five thousand dollars and the church was largely prospered in spiritual as well as in temporal matters. 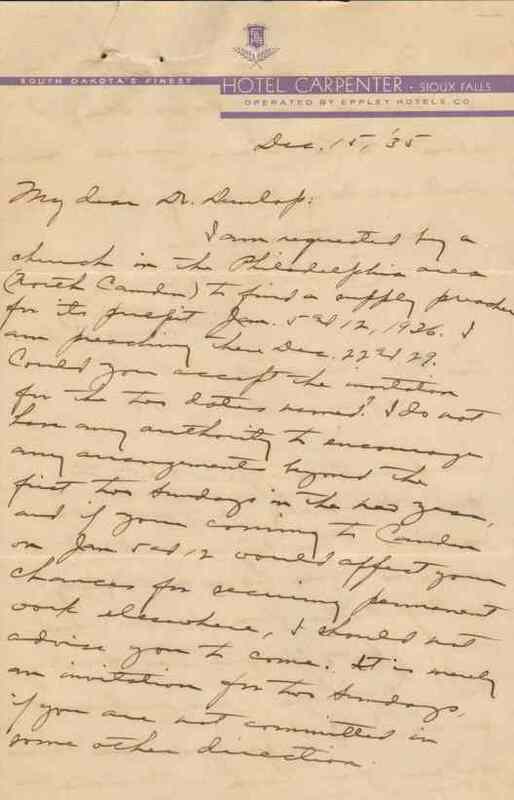 Mr. Dare resigned February 16, 1868, and on March 23, 1868. Rev. 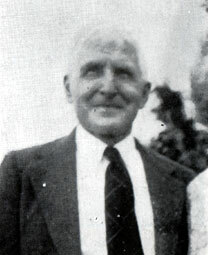 A.G. Thomas, pastor of the church at Mount Holly, was unanimously elected to the pastorate. His administration continued until December 25, 1870, when, in consequence of a serious affection of the throat, he resigned. Rev. J. E. Chambles, of Baltimore, was called to become pastor March 8, 1871. He began his work the 1st of April ensuing and continued until May 1, 1873. On July 9, 1873, a call was extended to Rev. E.G. Moses, lately of Plymouth, England. During this pastorate, which continued for eight years, one hundred and sixty-eight were added to the church,' a new mission building was built at a cost of four thousand dollars and large improvements were made in the meetinghouse. 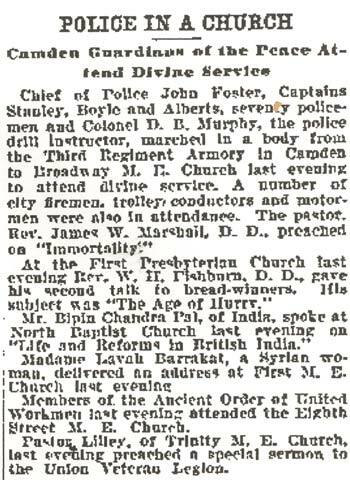 This pastorate ended with the year 1881. 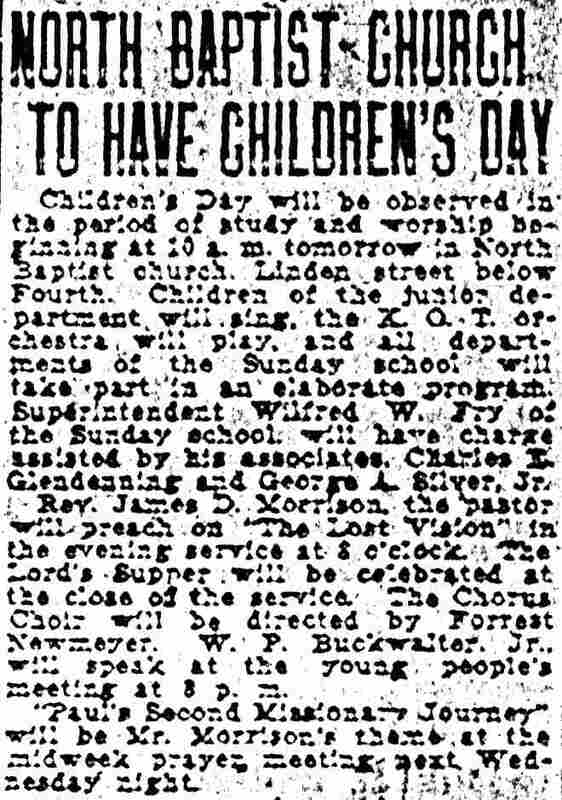 April 4, 1882, a call was extended to Rev. A.E. Rose, pastor of the First Baptist Church of Bradford, Pa. Mr. Rose began his pastorate April 9, 1882. The membership of the church was increased by an addition of one hundred and sixty — one hundred and twenty-four by baptism, thirty-five by letter and one by experience. A new organ, costing two thousand dollars, was placed in the gallery. Mr. Rose resigned his pastorate, to take effect August 5, 1883. 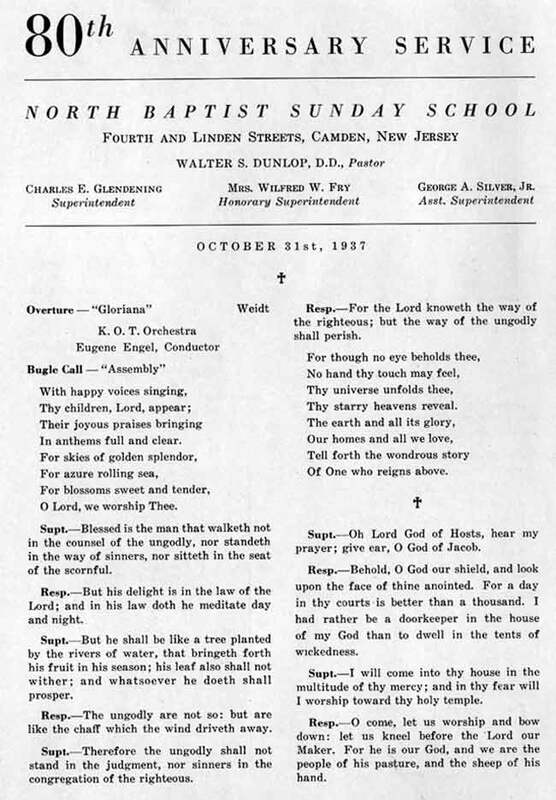 On December 10, 1883, a call was extended to Rev. 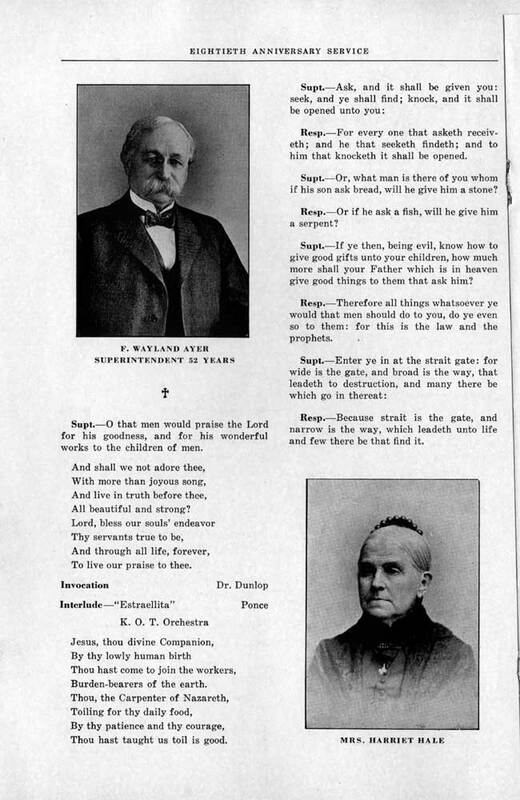 W. T. Burns, pastor of the First Baptist Church of Lynn, Mass., which was accepted, and Mr. Burns began his pastorate February 1, 1884. During this pastorate one hundred and sixty-eight have been added to the church. Of these, one hundred and ten have joined by baptism, forty-five by letter, twelve by experience and one by restoration. An addition has been made to the property of a building for the primary department, costing three thousand dollars; a church library of two thousand volumes, costing about two thousand dollars, and involving alterations costing one thousand dollars more, has been added. A library-sustaining fund of five hundred dollars a year, for five years to come, has (1886) been subscribed. The enlarged accommodations furnished the Sunday school by the building of the annex for the primary department, have been taken up by the growth of the school, the average attendance for May, 1886, showing an advance of twenty-one percent over that of May, 1885. The growth of the school is largely due to the energy and faithful personal attention to its work of the superintendent, F. Wayland Ayer, seconded by a faithful and well-disciplined corps of teachers. 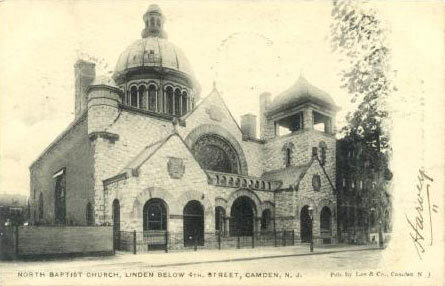 In December 1885, letters were granted to fifty-three members of this church for the purpose of uniting to organize the Linden Baptist Church, to be situated at the corner of Ninth Street and Linden. Notwithstanding this large subtraction from the roll of the church, the vacant places have been very rapidly filled. .
A new church building at 317 Linden Street was first used for public worship on May 29, 1894. The Calvary Presbyterian Church purchased the old church building in the summer of 1895 for $18,000. 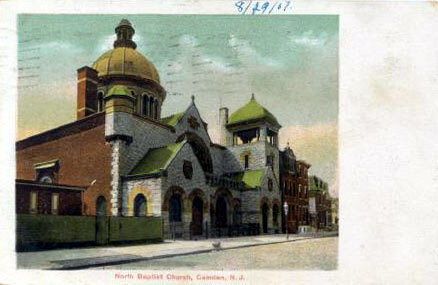 The North Baptist Church on Linden Street was quite active in Camden for many years, until declining membership forced its closing. By the early 1970s the property had been acquired by Rutgers University's Camden campus, which used the building for a few years. By the mid 1970s the church and all other buildings on the block had been razed to make way for expansion of the college's operations. 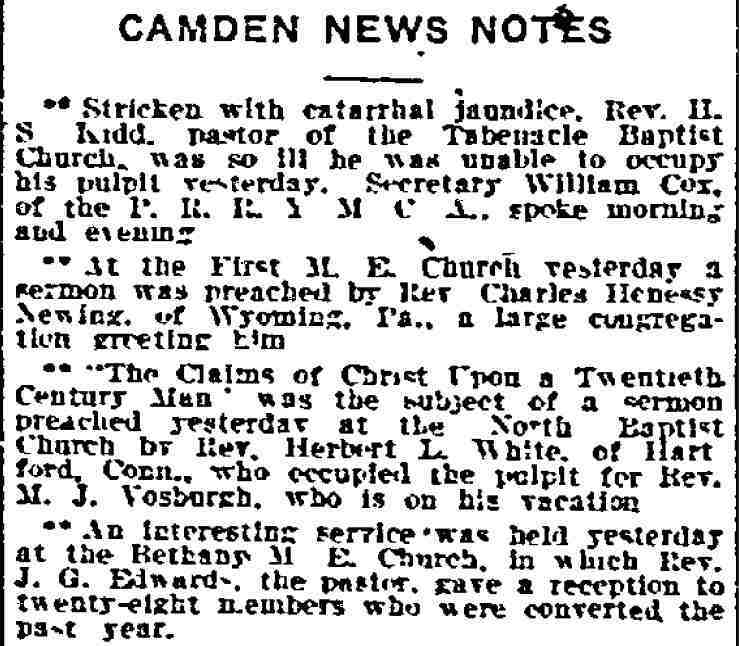 WHAT was Camden like a century ago when North Baptist Church took its place in the life of our city? "A pleasant, though lusty town" is the answer. Incorporated in 1828, it was also the County Seat and in 1859 was divided into three Wards, North, Middle and South. 1857-first Building and Loan Association, "South Ward"
1860-first weekly newspaper, "West Jersey Press"
From 1852 to 1857, well known churches were organized, but November 1859 is the important date for us, when North Church began the wonderful work for the people of North Camden that has continued for one hundred years even until today. "Except the Lord build the house they labour in vain that build it." Psalms 127: 1. The first years of North Church coincided with the rising clouds of the Civil War that overshadowed the whole nation, as well as Camden. The panic of 1857 had its disastrous effect on the community too. The ferries played a very important part in the early development of our city. For many years our city was called Cooper's Ferries or The Ferries. All the early settlers built their homes near the ferry at Cooper's Point. Later a ferry at Kaighn's Point was established. Baptist Church, the name "North Baptist Church" was adopted, and on November 22nd, at a public service of recog­nition, thirteen churches approved the new organization. 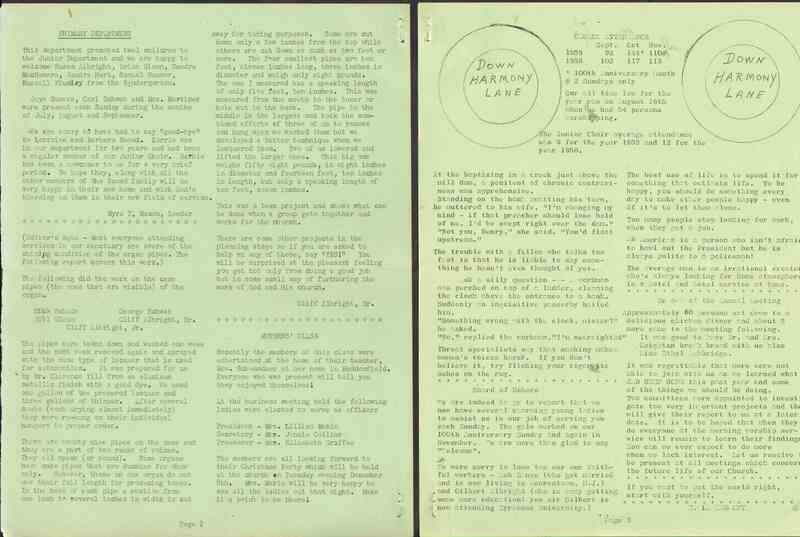 From the diary of our first minister, R. S. James, we have a historical sketch of the early days of North Church. "During the time I administered to North Church I never had to send for an evangelist to carry on a revival- it was a revival all the time, and that instrumentally through the earnest cooperation of the membership." "The church visited the baptismal waters ten times during the first years of its existence. At the first of these, January 29, 1860, I baptized David T. Stackhouse and his wife, Amos Ireland, his wife, and Hannah M. Sharp. We went to the Delaware River eight times in 1861. 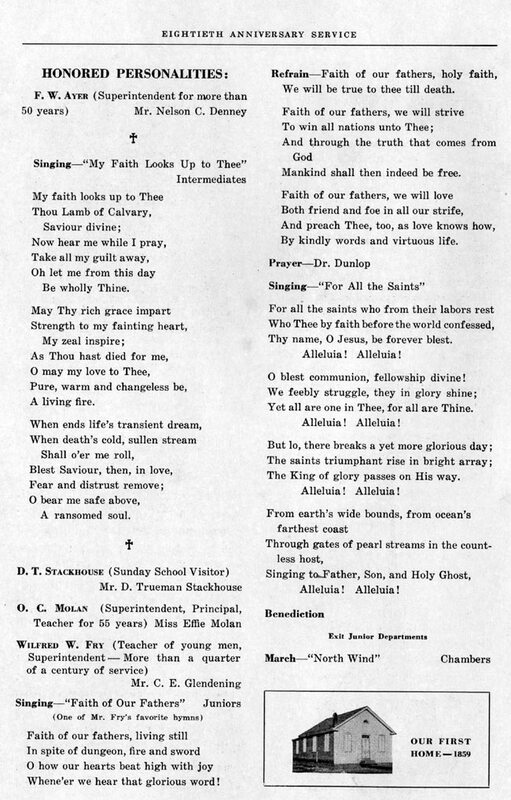 In all I baptized seventy-seven"
My work at the North Church ended with a Watch Night meeting on December 31, 1863." The second pastor, Rev. Samuel C. Dare of Canton, N. J., began his term of service January 24, 1864, and preached his farewell sermon February 14, 1868. 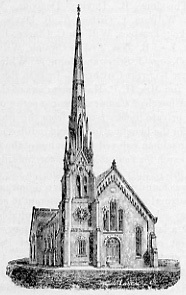 During his pastorate the church edifice at the corner of Second and Pearl Streets (now occupied by the Faith Baptist Church) was erected at a cost of $31,108.01. On February 28, 1865, the chapel or Sunday School room was dedicated and a year later, February 18, 1566, the church proper was dedicated. church $100. 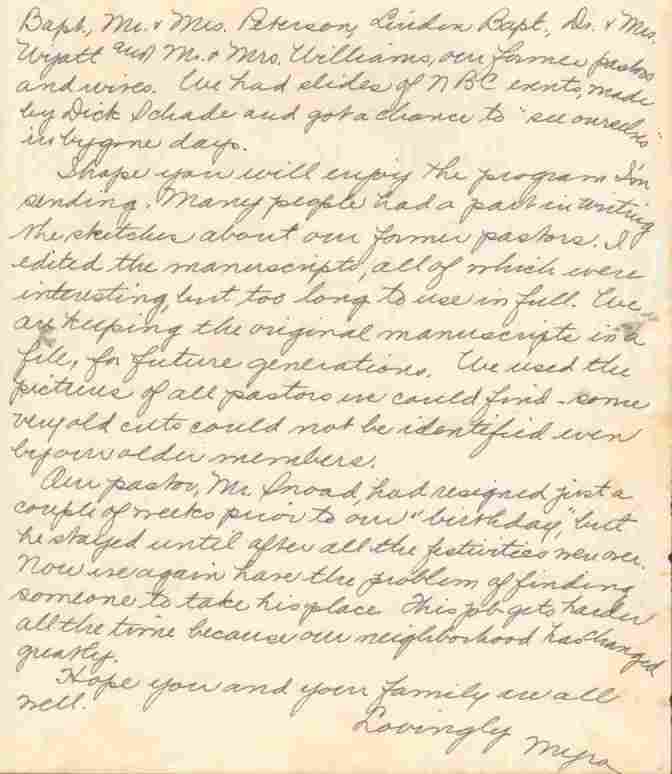 On September 24, 1869, Mr. N. W. Ayer and family became members of the church. He was elected to the Board of Trustees two months later, subsequently made Deacon, and laboured steadily and successfully to build up the church and decrease its indebtedness. Rev. Joseph E. Chambliss, of Baltimore served as pastor from April 1, 1871, to May 1, 1873. During his pastorate the floating debt of the church was paid, and the envelope system of collection was adopted. In 1873 Mr. F. W. Ayer was elected a Trustee, taking the place of his father who died that year. Rev. Robert G. Moses, of Falmouth, England, served as pastor from September 7, 1873, to December 31, 1881. During the pastorate of Mr. Moses the building for the Linden Mission School was erected at a cost of about $4000.00 and many improvements were made in the edifice of the church. Rev. Moses was followed by Rev. Alfred E. Rose, of Bradford, Pa., on April 9, 1882, who served until August 5, 1883. 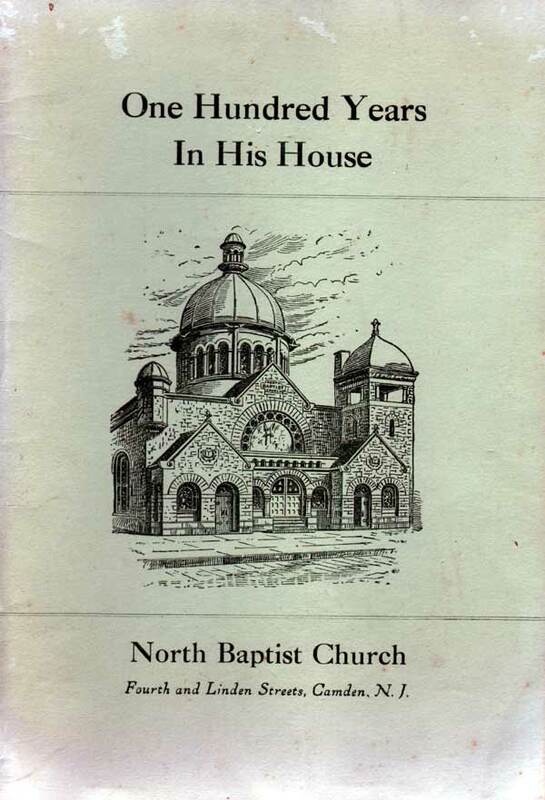 During his pastorate one hundred and forty-nine members were added to the church; a pipe organ was placed in the church building at a cost of $2000.00 and a monthly magazine was published by the church which was subsequently known as THE NORTH CHURCH BULLETIN. Rev. 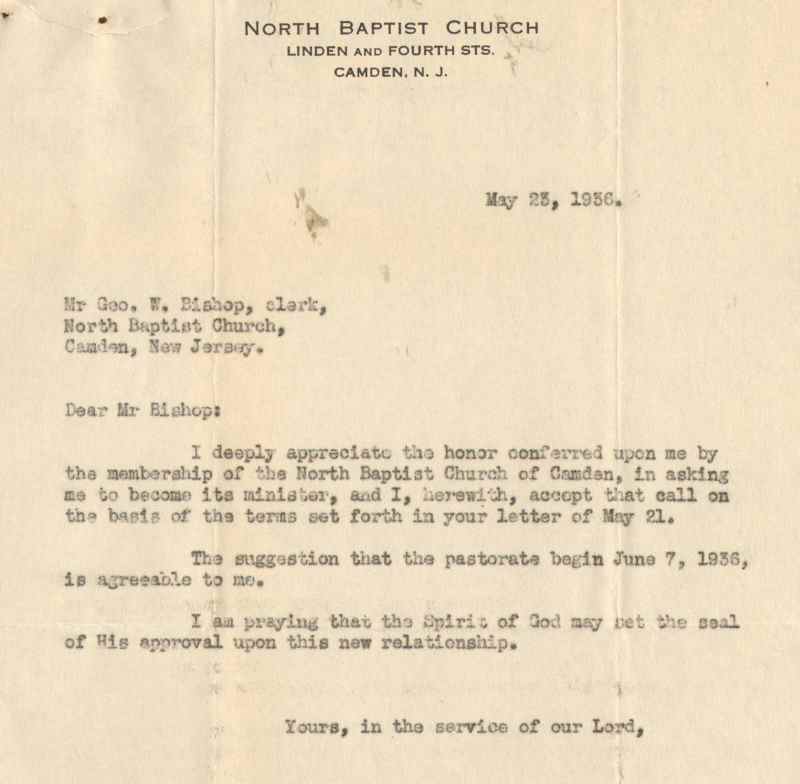 William T. Burns, of Lynn, Mass., succeeded to the pastorate February 3, 1884, and resigned April 8, 1887. During the ministry of Mr. Burns the membership largely increased; the church library was established with two thousand volumes and an annual sustaining fund of $500.00 was pledged. A Library Board of Control with Mr. Clayton W. Nichols as chairman was appointed to direct the library. 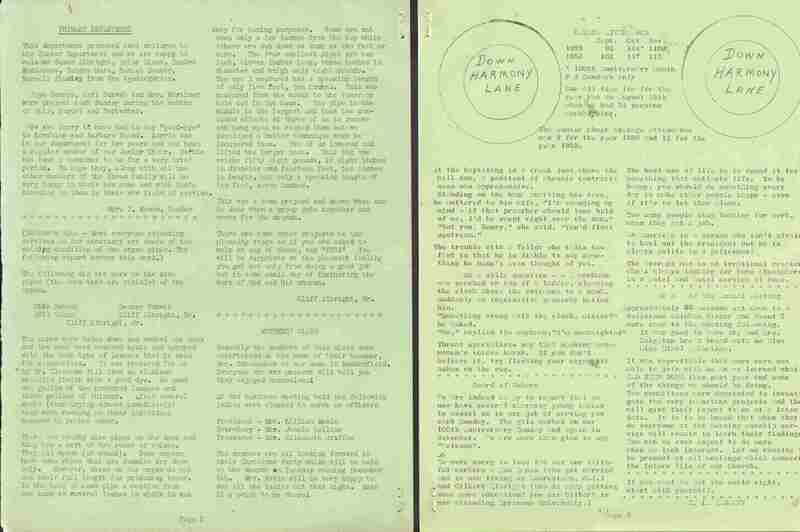 A Library Day was appointed for entertainment and the receipt of contributions, which was celebrated for sixty years. 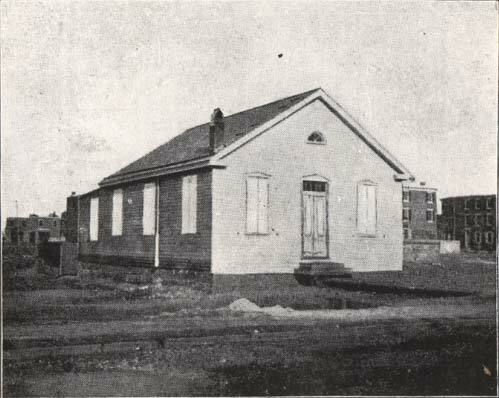 A building was erected for the primary department of the Sunday School at a cost of $3000.000. The Linden Baptist Church, formerly a mission, was organized with fifty-three members from the North Church during the pastorate of Mr. Burns. 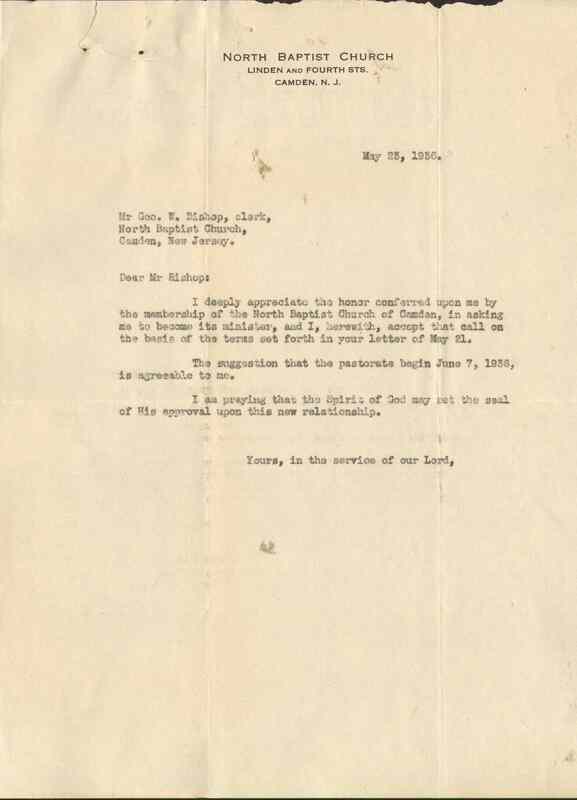 In December 1886 the North Church appointed a committee to take steps to select a site, prepare plans, procure estimates, and to suggest methods for the raising of funds for a larger and more convenient church building. 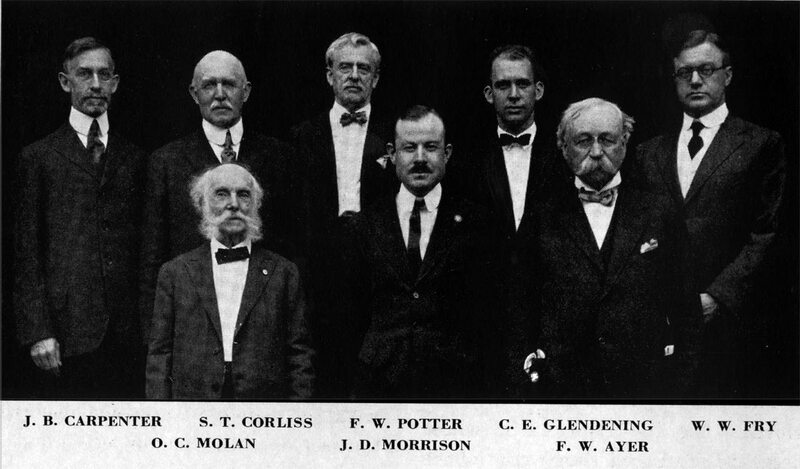 On November 20, 1888, the Board of Trustees united with this committee and others to form the Building Alliance. On the same day $23,380.00 was subscribed for the new building. 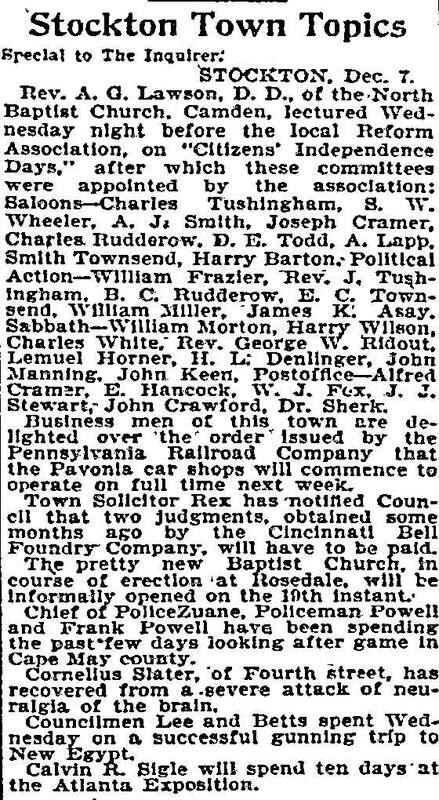 Mr. Thomas Lonsdale of Philadelphia was elected as architect and Mr. John C. Rodgers, a member of the church, as builder. The Building Alliance was supplemented by the Women's Alliance, which pledged and paid $3000.00 towards the building. Rev. B. F. McGee, of Charleston, W. Va., became pastor of the church December 13,1887, and resigned October 31, 1889. During his pastorate efforts to select a site and to secure subscriptions for the new building were continued. attending); he was foremost in securing the organization of the American Educational Society in 1888; was helpful in Y. M. C. A. work. It was said of him that he was not bounded by denominational lines or doctrinal bonds. He resigned March 31, 1902, after serving twelve years, longer than any other minister, and to those of the congregation who were privileged to know him, his memory is still fresh, shining and beloved. 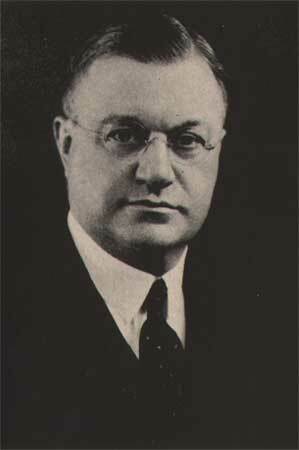 Dr. J. Fittredge Wheeler, of Chicago, Il1., became supply pastor on Sep­tember 13, 1903, and pastor on June 12, 1904. 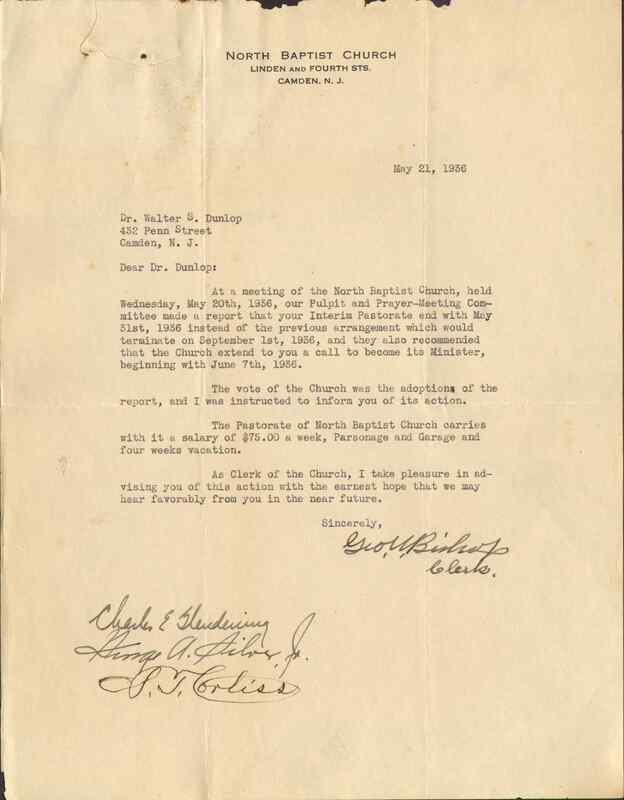 His pastorate was highly suc­cessful-large numbers were added to the church and on one occasion, April 17, 1904, seventy-one were received into the church. Women's Missionary Society worked successfully for Home and Foreign Missions. In conjunction with First Baptist Church, North Church assumed the support of Rev. Joseph Taylor, missionary to China. An "Old Home Day" was made a feature of the church work. 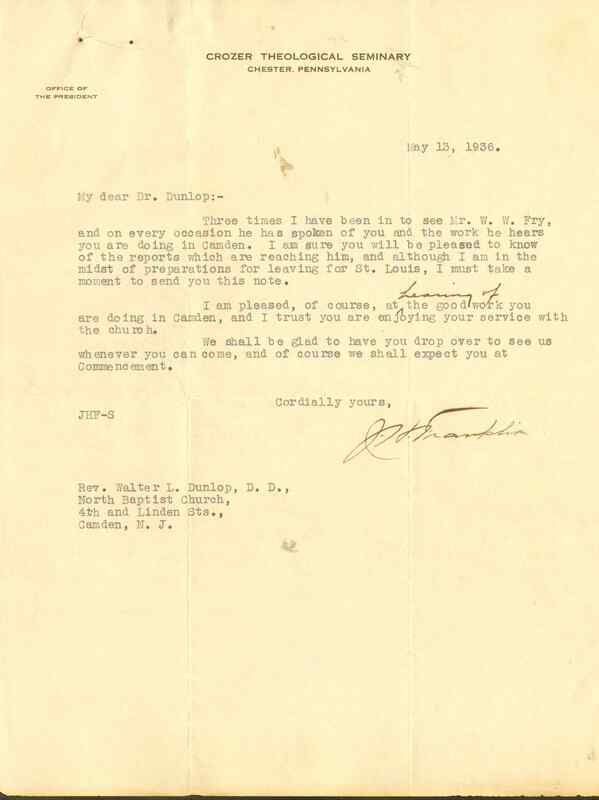 Dr. Wheeler's resignation became effective September 30, 1909. 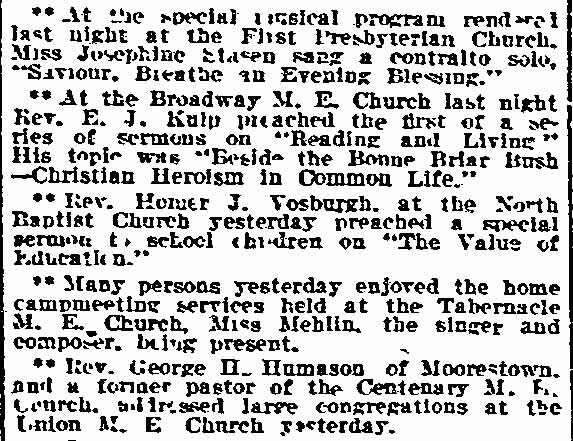 Homer J. Vosburgh served the church from January 1911 to July 31, 1920. Dr. Vosburgh was much interested in young people, being primarily an educator. The Sunday School was one of the largest in the state and loomed so important that the development of a strong church membership suffered. This fired Dr. Vosburgh's aim to inspire and arouse interest in the spiritual realm and also the intellectua1. Dr. Vosburgh was interested in all of his members and did a lot of calling en them. His sermons were thought-provoking, stimulating and long. 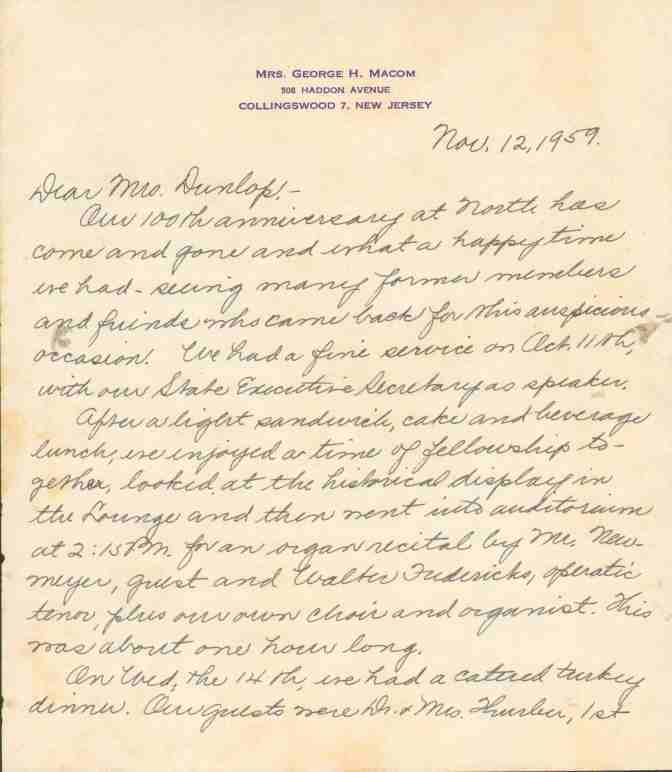 While he was pastor, in 1917, Mr. Ayer presented as a memorial to his wife, Rhandena Gilman Ayer, an organ which was said to be the finest in South Jersey. It was unique because it really was four organs combined into one. It was controlled by electric shutters. 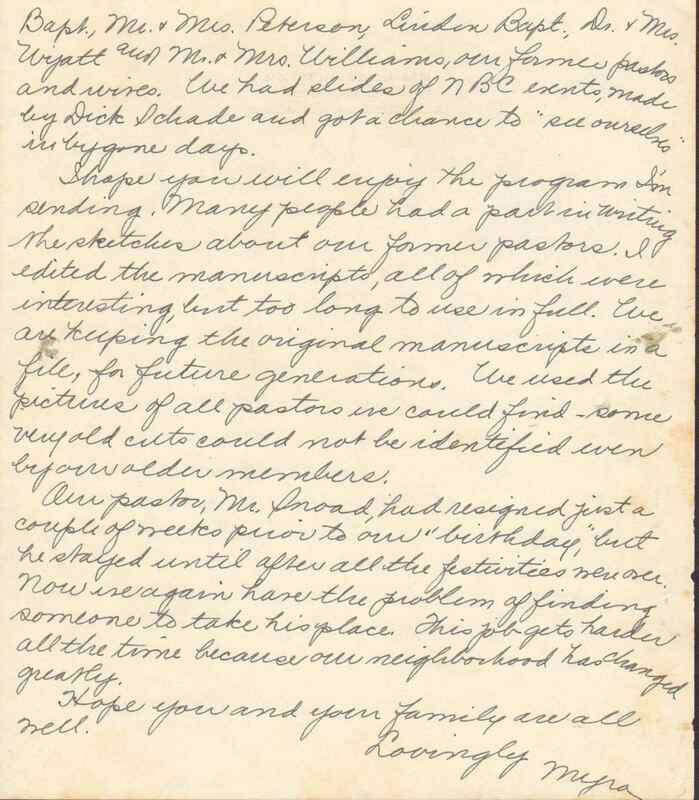 On July 11, 1920, one of our young men, Willard F. Johnson, was licensed by the church to preach. 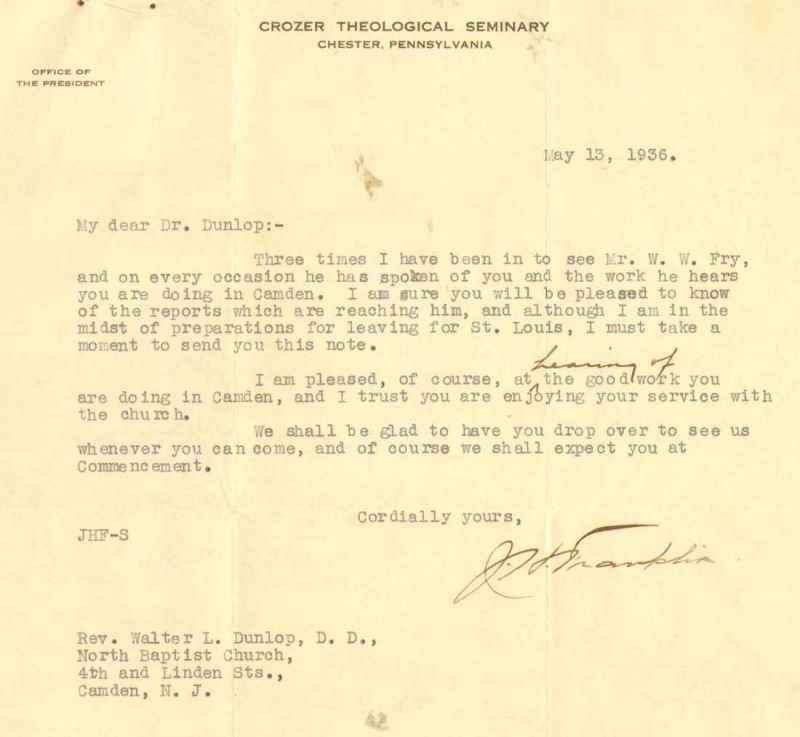 Having served the church, Dr. Vosburgh left in 1920 for Watertown, N. Y., and after that pastorate, returned to us for a few months as interim pastor. There are a few of us who still are grateful for his abiding interest and influence on our lives. 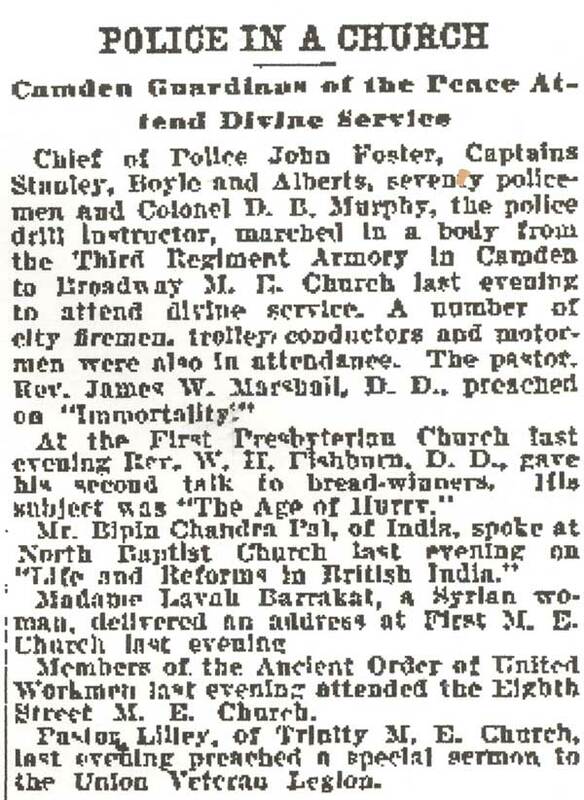 James Dalton Morrison, born in Ontario, Canada, was called to the pas­torate of our church where he served with distinction for six and one-half years, from June 5, 1921, to November 17, 1927. A graduate of McMaster University, which conferred the degree of Doctor of Divinity upon him in 1940, he had also received the degree of Bachelor of Divinity from Rochester Theological Seminary, now Colgate Rochester Divinity School. "The renovated and redecorated auditorium of the church and the beau­tiful pews, are the gift of Mrs. Anna Ayer Fry, in memory of her father. "The memorial pulpit, pulpit furniture, communion table, deacons' benches and the acousticon are the gift of members of the church, school and congregation." Mr. Morrison brought a dedication to his Master that resulted in growth in this time of change. 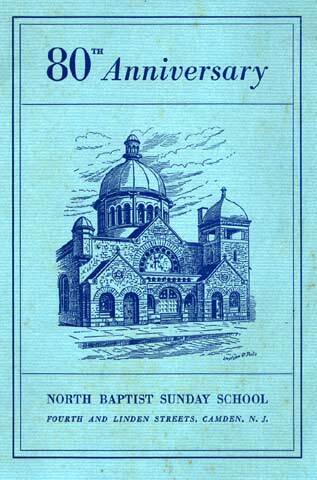 On Easter 1925, 22 were baptized and 32 welcomed into fellowship. On other occasions, 21 more were baptized. He loved poetry and many will recall his use of quotations in his sermons. He developed a special interest in preaching and worship and compiled and edited "The Minister's Service Book," a manual of worship for use of pastors. "Masterpiece of Religious Verse," 2020 poems by 900 poets, was edited by Mr. Morrison and published by Harper & Brothers in 1948.
Who can measure the influence of a life of service dedicated to the Master, and we at North who had the privilege of the friendship and ministry of James D. Morrison, are enriched. He served the Lord and his church well. He lies where he loved to vacation in a simple village among a hardy, some may say, an austere people. Dr. Finnie came to this country from Glasgow, Scotland. He was educated at Doane Academy, Denison University and Newton Theological Seminary. He held a Doctor of Divinity degree from Bates College and was a member of Phi Beta Kappa. laymen of the church. Under his teaching, the Northmen class became a very strong men's group. Annual Watch Night services started with a social period and as New Year approached were most inspiring. 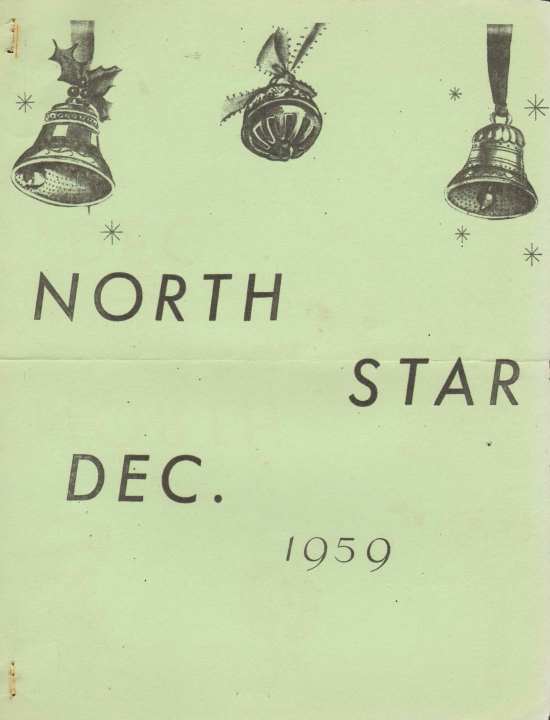 Social activities and dramatic presentations were promoted by the Northmen's class and other groups during this period-some original music was written by Mr. D. T. Stackhouse for the glee club. In addition to pastoral duties, many calls were made on Dr. Finnie for counsel and assistance and he gave of his resources and strength without stint. He loved books and the Library received his earnest support. Wednesday prayer services promoted under the theme "Come ye ourselves apart and rest awhile" added much to the spiritual life of the church. During his pastorate accessions to our church were 95 by baptism, 20 by letter and 5 by experience. He served our church from March 3, 1929, to November 1935. 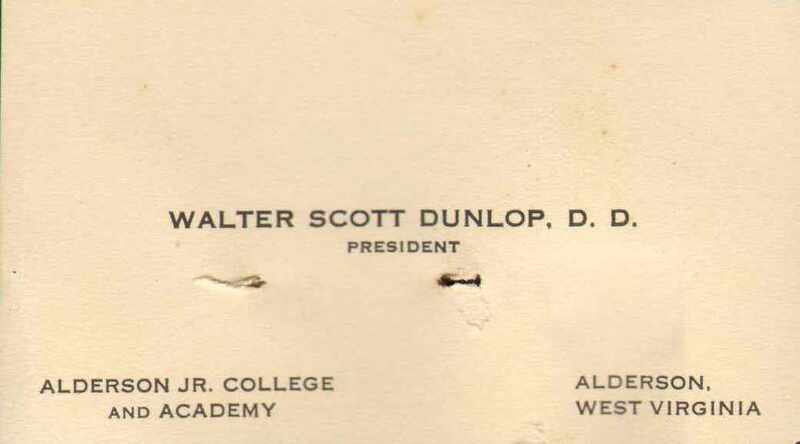 Dr. Walter Scott Dunlop began his ministry at North Baptist Church as interim pastor in February 1936 and became pastor June 7, 1936. He was a graduate of the University of Pennsylvania and Crozer Theological Seminary and a Vice-president of the American Baptist Publication Society. At that time our church membership was 550.
supreme effort must be the winning of souls- the outstanding business of the church is restoring the consciousness in the hearts of men and women of the love of God. Dr. Dunlop was very popular with our young people and endeared himself to them. In his three years here, fifty-nine were added to our church roll, and a special reception was held for these new members. In 1938 a new console for the organ was presented by Mrs. Fry in memory of her husband, Wilfred W. Fry, making our organ rank as one of the best in this part of the state. Our records state "our appreciation of his fine Christian character, his whole-hearted devotion to the work of our Master and the interest of our church ... his counsel was kindly, his example courageous. He gave freely of his services to members of the church and the community in need of counsel, help or comfort." His countenance reflected his deep spiritual nature. 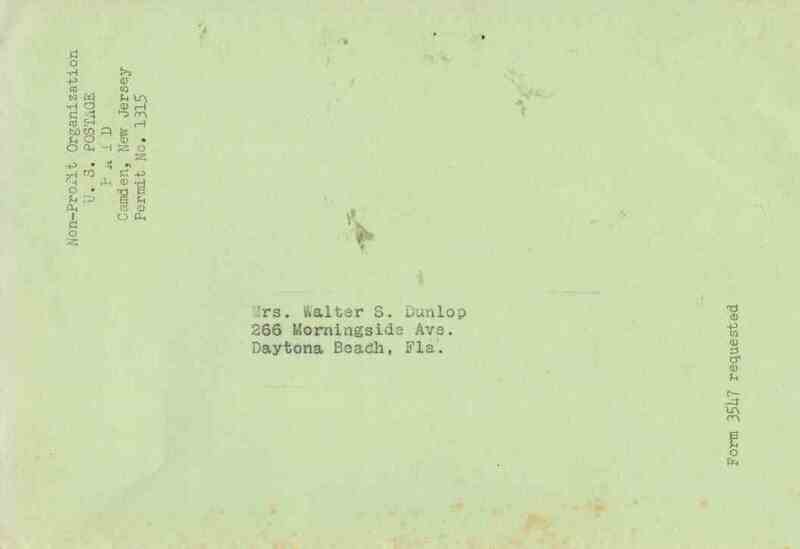 His pastorate closed February 26, 1939. Rev. 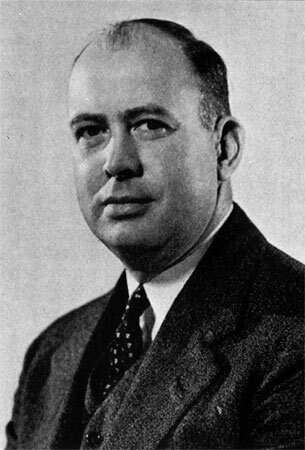 H. O. Wyatt was the 15th pastor of North Church, arriving July 1, 1939, and remaining until January 31, 1944. Ninety persons joined our church during this pastorage, 64 by baptism, 22 by letter and 4 by experience. Rev. Wyatt was at North during the Second World War and was kept extremely busy. Evening services each Sunday and Mid-week Prayer services were held; many pastoral visits were made; outside demands were great. He served on many committees- China Relief, U.S.A., Red Cross, Russian Relief, Community Chest, War Bond Sales and many others. organized Young Peoples group. A dramatic group was formed and most capably coached and directed by Mrs. Wyatt. Rev. Wyatt left to assume duties in the New Jersey Baptist Convention. Clayton L. Williams, a student at Crozer Theological Seminary, first came to North Church to assist Dr. H. O. Wyatt. He was called to the task of organizing and implementing a weekday program to meet community needs. North Church licensed him to preach and perform other pastoral duties. 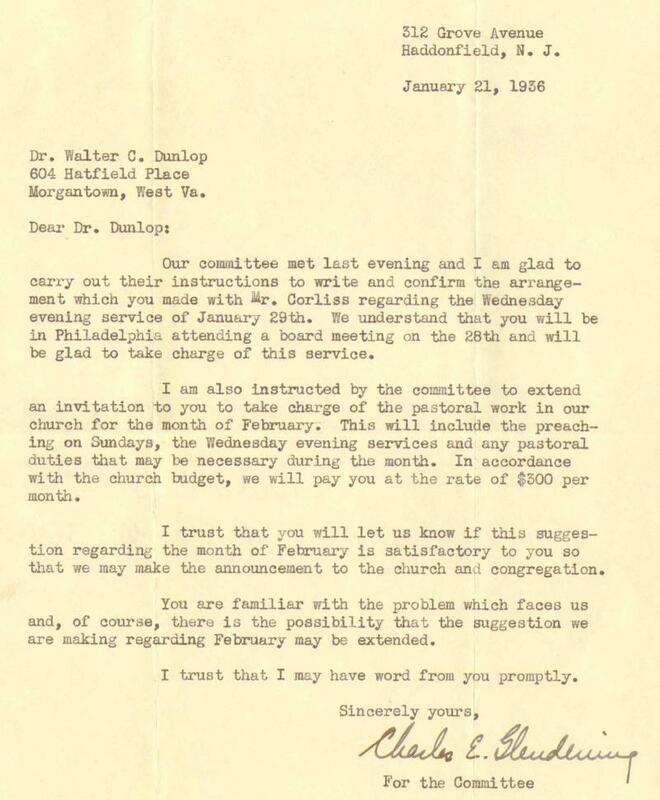 When Dr. Wyatt resigned, Mr. Williams continued as interim pastor and on June 1, 1944, became pastor. 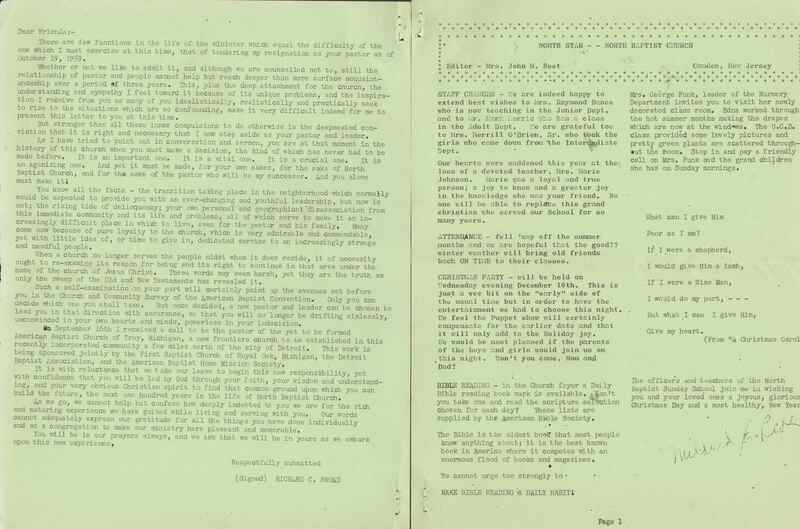 Mr. Williams' vision of Christ ministering to boys and girls was translated into activities which brought hundreds of children into our church in varied weekday programs, i.e., Boy and Girl Scout Troops, Cub and Brownie Packs, Woodpeckers, Junior Choir, all flourished. The Happy Hour added its joyous note on Friday evenings and had came well known and loved by the children, who called him the "Happy Hour Man." 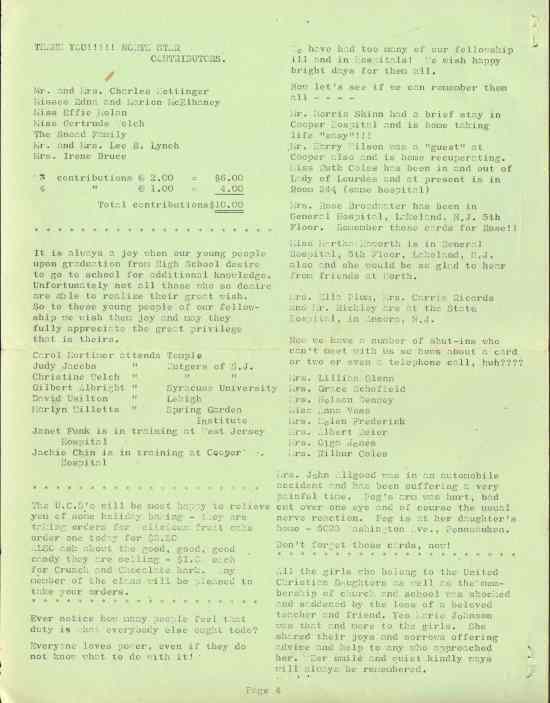 A board of Christian Education supervised and staffed the above activities. Mr. Williams was also a member of the Board of Managers of the Camden Christian Center. 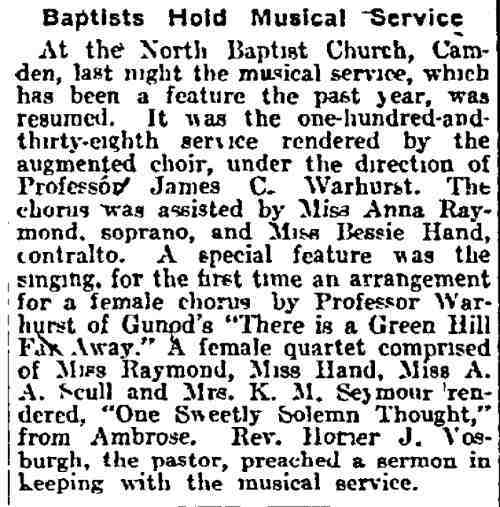 When he resigned to become field representative of the American Baptist Home Mission Society, the Courier-Post on December 4, 1949, displayed a picture captioned "Youngsters Bid Farewell to Camden Pastor." Rev. L. Paul Bowling, our 17th pastor. assumed his duties in September of 1950 and served 11 months, leaving on August 31, 1951, to become Youth Director with the Convention. Our membership increased by 29 during this pastorate- 23 by baptism, 5 by letter and 1 by experience. A class of 15 was baptized on March 25th and a procession of these receiving the Right Hand of Fellowship on Palm Sunday marched around the sanctuary waving palm fronds. Rev. 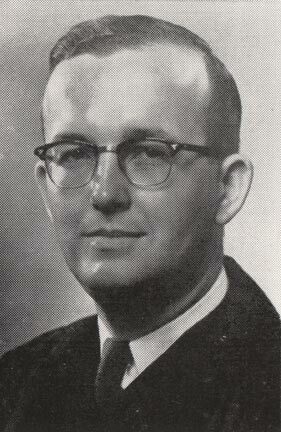 Fred E. Young was called to North Church in October 1952 and assumed his duties November 2, 1952. Everyone present at the first Prayer Service came away aware of the warmth of this family. He made over 900 calls the first year and over 1000 the second. 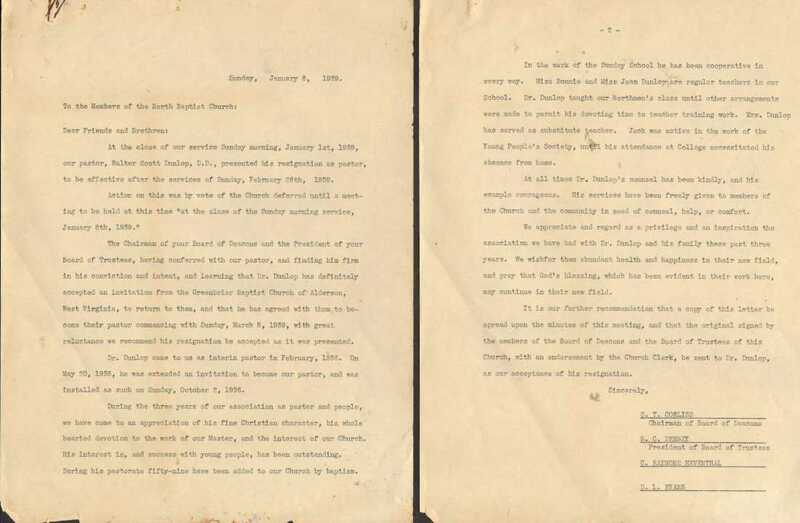 In his first annual report he said "To know our people and to become acquainted with their needs and aspirations will necessitate my calling in your home." A familiar figure along the streets of North Camden, persons from all walks of life came to know and call him "friend." Twenty joined our church through the ordinance of baptism, 8 by letter and 1 by experience. Rev. 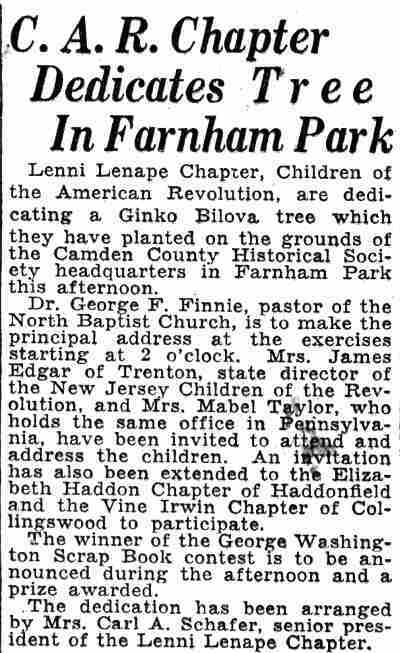 Young participated in many phases of our Camden Baptist Asso­ciation, as well as civic obligations; took part in annual Thanksgiving and Good Friday services, also Sunrise service (Easter) in Collingswood; con­ducted vesper and communion services at Lakeland Hospital; was Camp Counsellor at Lebanon and Unami for two week periods; taught Old Testament at Baptist Institute and Crozer Seminary, serving there as Visiting Professor. During his pastorate he received his Doctor of Philosophy degree from Dropsie College. He instituted "Homecoming Sunday" at North. Dr. Young was a master of languages, being able to read and speak many tongues. 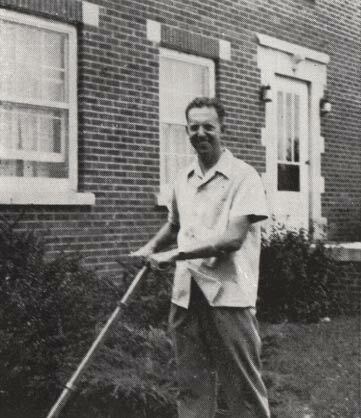 In May 1955 Dr. Young left to join the faculty of Central Baptist Seminary in Kansas. 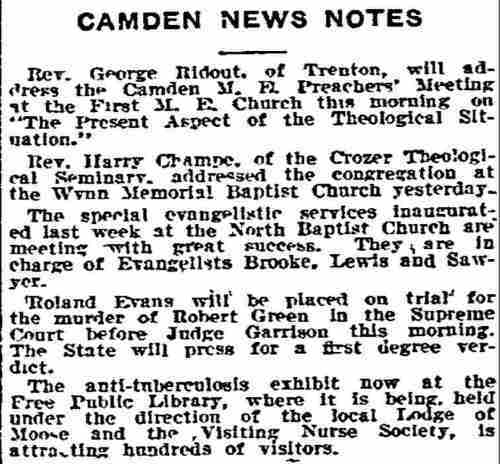 Although many prominent figures in Camden's civic life have contributed greatly to the development of the church, without the "nameless saints," the "many unknown" who came year after year, there could have been no North Baptist Church. It is difficult to write history while we are in the process of living it. To you, our present minister, Richard C. Snoad, on the occasion of our 100th anniversary, we pledge our loyal and earnest support. 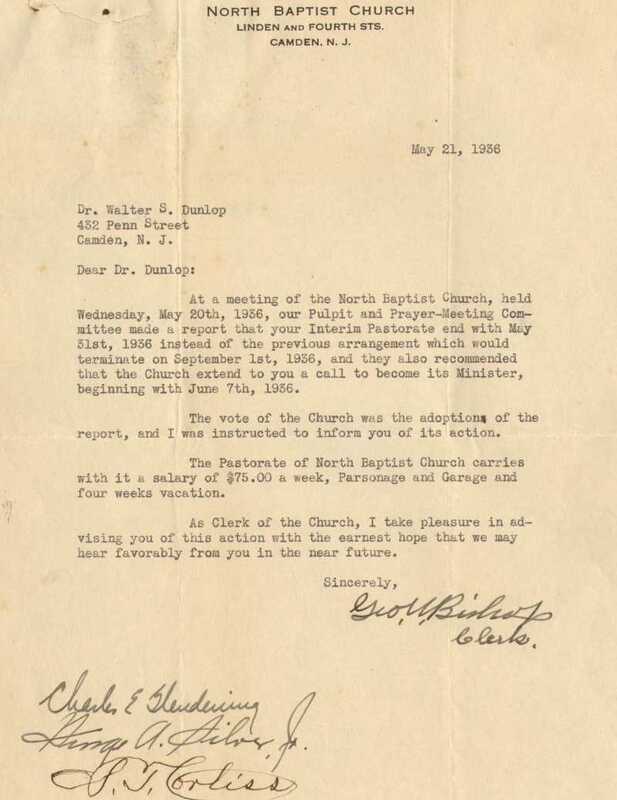 We all sincerely hope that you will help us to preserve this rich and fruitful heritage of North Baptist Church in the years ahead. 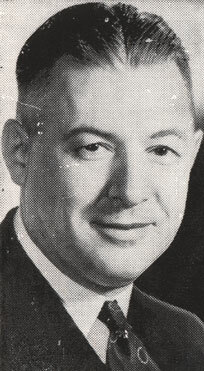 Mr. Snoad began his ministry on July 1, 1956. We express our appreciation and thanks to all who have contributed to these historical sketches. Rev. 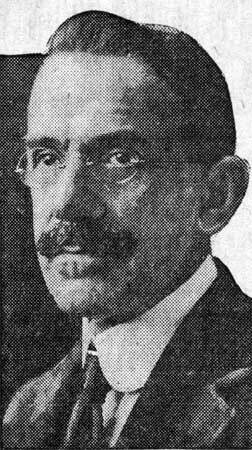 Homer J. Vosburg - Y.M.C.A. Rev. H.J. Vosburgh - Rev. Trela D. Collins - Forest Hill Park - Y.M.C.A. 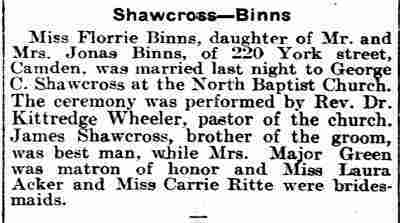 Miss Ruth Viola Boogar, daughter of Mrs. Stella Boogar, of 325 Bailey Street, this city, became the bride of Charles C. Watson, of 1930 Pine Street, Philadelphia, last evening, in the North Baptist Church. The ceremony took place at 7 o'clock, with Rev. 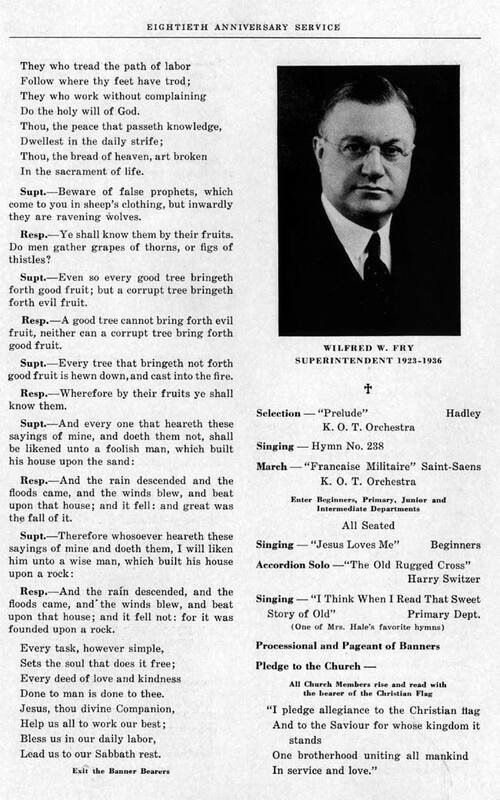 George B. Finney, pastor of the church, officiating, Forrest W. Newmeyer, organist of the church, played the wedding march and accompanied Mrs. Ella Alden Hartung in vocal selections preceding. The bride, who was given in marriage by her grandfather, Frank Verlander, of this city, wore a gown of ivory satin, rich in its simplicity, with a tulle veil arranged cap effect. Her bouquet was a shower of roses and lilies of the valley. Miss Mildred Boogar was her sister's maid of honor and Miss Rhandena Ayer Fry, of Camden, and Miss Grace Cleeland, of Highland Park, Pa., were bridesmaids. Miss Boogar's gown was a lovely model of eggshell taffeta and flame colored velvet and with it she wore flame colored velvet hat and slippers. She carried a round bouquet of roses to match her frock. The bridesmaids appeared in taffeta and velvet also, but in a turquoise-blue shade, trimmed in cornflower yellow. Their hats and slippers matched the corn-color velvet that trimmed their frocks and they carried round bouquets of tea roses. 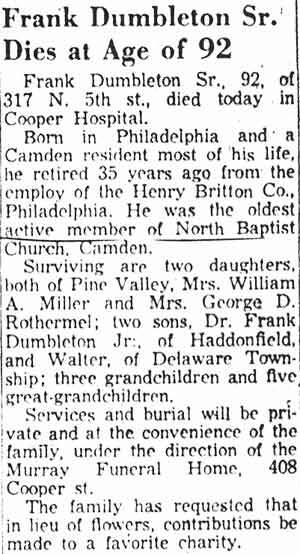 William W. Rowan, of West Philadelphia, was best man and Harold Boogar, of this city, brother of the bride, and James Hilly, of Stonehurst, Pa., ushered. Mrs. Boogar had selected a gown of black chiffon with black soliel hat and a corsage of white gardenias. On their return they will make their home in the Stenton Hall Apartments, Germantown. Through eighty years of sacrificial service the North Baptist Sunday School has been sending out into all parts of this and other lands, lives that here have been consecrated to the noblest cause on earth. The day of its beginnings was small. Like the Captain in whose name it has labored, the North Church School was born amid humble surroundings. In an upper room in a silk factory which belonged to Mr. German Foss, on the northwest corner of Front and Pearl Streets, the organization of the School was effected on September 7,1857. Mr. E. V. Glover, a deacon of the First Baptist Church of Camden, was chosen Superintendent. 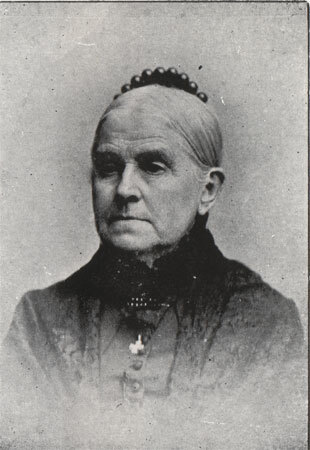 Three other officers were elected, one of whom was Mrs. H. P. Hale, who had an important place in the establishment of the North School and Church. Eighty-eight scholars were inscribed on the rolls, together with the names of six who devoted themselves to the task of teaching. After sixteen months of work and service in the silk factory room, the School was moved to a carpenter's shop located at Second and Birch Streets. There the interest grew, and on July 31, 1859, before the School had reached its second anniversary, a frame building on the north side of Elm Street below Second was dedi­cated at a cost of about $2500. For some time in the new building the School met in two sessions: the one at 9 :30 A. M., the other at 2 P. M. The morning session was soon discon­tinued, and until Oct. 3, 1923, the classes met regularly in the afternoon. After five years of service in the little frame Church the School moved to a new and beautiful place of wor­ship, which was erected on the corner of Second and Pearl Streets at a cost of about $35,000. For thirty-one years in the Pearl Street property the work was carried on under the leadership of the most consecrated men and women a Sunday School could ever know. The crowded condition of a vigorous organization made it neces­sary to think in terms of larger quarters. 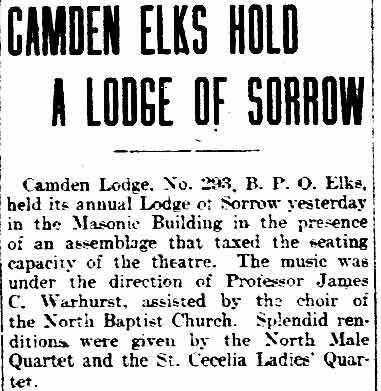 The outcome was the erec­tion of the present Church building which was first occupied on January 21, 1895; and here since that date "a great school marches on." ment is the history of sacrificing, and devoted lives. To know something of the names of those who served the North School as Superintendents is to understand the reason for the success of its work. The School has had altogether seven Superintendents. Mr. F. Wayland Ayer, who was elected July 1st, 1869, served for over fifty years. Beloved and honored by un- numbered men and women, boys and girls, whose lives God had touched through the ministry of this faithful leader, Mr. Ayer holds still a unique place in the life and affections of the School. 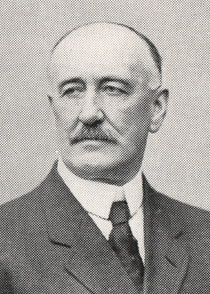 Mr. Oscar C. Molan, for some time Superintendent, later through the years associated with Mr. Ayer in the work as Principal, is another example of the quality of leadership enjoyed. Mr. Molan organized and taught Hope Bible Class, one of the oldest organ­ized Bible Classes in the State, for more than fifty years. 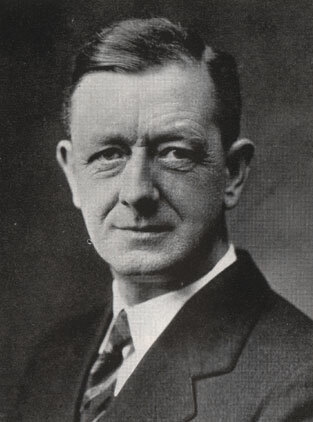 On March 22, 1923, Mr. W. W. Fry became Superintendent and from then until July 27, 1936, when the Master of all good workmen called him to higher service, Mr. Fry gave the best of those high qualities of heart and soul, with which the Heavenly Father had endowed him, to the promotion of the cause of Christ through this School. Affiliated with Mr. Fry were the present Superintendent, Mr. Charles E. Glendening and his associate Mr. George A. Silver, Jr., both of whom are carrying forward the work in the spirit of a great tradition. Mrs. Wilfred W. Fry, recently elected to the position of Honorary Superintendent of the School and to membership on the Executive Committee, is Director and Superintendent of our well-organized Children's Division. To the work among the children, Mrs. Fry has given many years of consecrated service. The names of those serving the North School in other capacities have been and are likewise men and women of rare devotion. There have been five secretaries throughout our history. The man who now serves in this office, Mr. S. T. Corliss, has for over thirty­six years devoted to his task, business ability of a high order as well as heartfelt consecration. Eight have held the office of trea­surer since 1857. Some of these are known and beloved by the School of today. 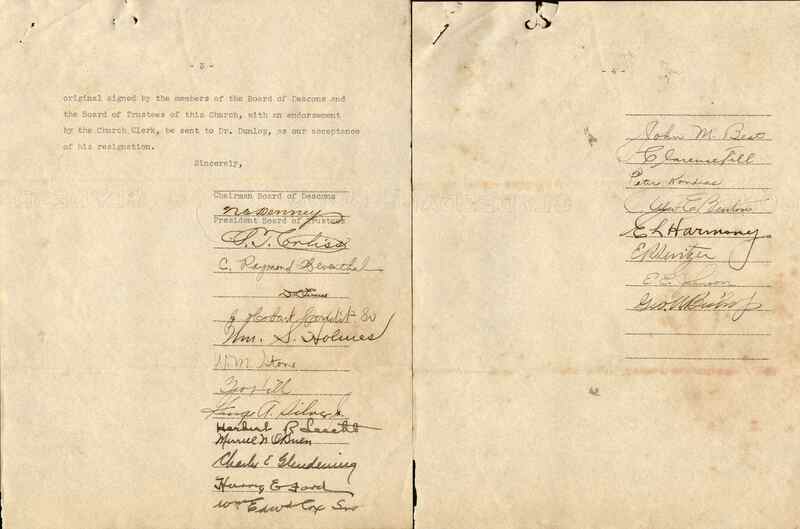 We honor such names as Mr. Nelson C. Denney, Mr. John W. Glendening, Miss Minerva C. Stackhouse. Length of years has been given to our present treasurer, Mr. F. Wayland Potter, who for almost a quarter of a century has given his best to this important work. When the earthly chapter of the North School's history has been com­pleted, other names-some remem­bered, many forgotten-will share in the glory of a task well done. "In the name of our God will we set up our banners." Melvin LeMon, who will direct the Bucknell University Men's Glee Club of 67 voices in its concert at 8 p. m. February 8 in the North Baptist Church combines the musical scholar with the gifted conductor. Assistant professor of music at Bucknell, LeMon teaches classes in harmony, counterpoint, and other technical aspects of music. Yet it is on the conductor's podium, as he leads the Bucknell gleemen through a wide repertoire, that he is most at home. Since LeMon took charge of the Bucknell Men's Glee Club six years ago, he has built it into one of the outstanding organizations of its kind on Eastern campuses. A graduate of the Eastman School of Music, Rochester, N. Y., where he was trained as an organ performer and received both his bachelor's and master’s degrees, LeMon also teaches organ at Bucknell an he is director of the university band. 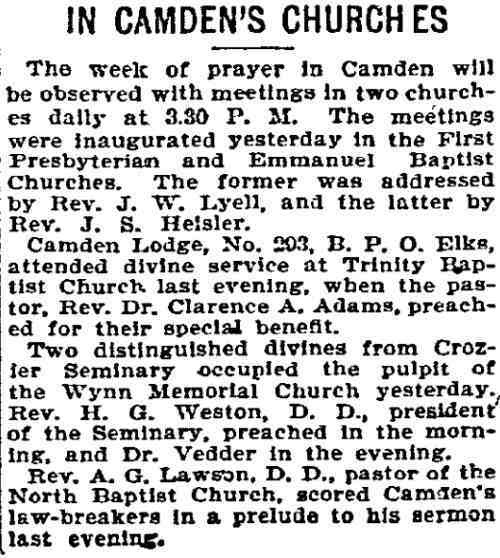 Organized February 5, 1818, when Camden was a village of fewer than 900 residents, the First Baptist Church of Camden yesterday began celebration of its 120th anniversary. It will continue with special services and music Wednesday and Friday nights. The program was arranged by Rev. 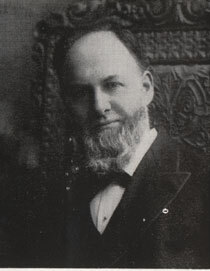 Elwood A. Harrar, pastor since 1922. A large congregation attended the opening anniversary worship service at 10.30 a. m., in the church edifice, Fourth and Arch streets, which succeeded the first meeting house built in 1818 and the second erected in 1839. Seminary, Chester, Pa., of which Rev. Harrar is a trustee. Citing the physical changes that have occurred in 120 years Dr. Franklin pointed out that the needs of man in respect. to his moral character and human relationships have not changed and that the church is as necessary today as it ever was. "The message of the church today must deal with all phases of human relationships, social, economic and political, as well as religious," Dr. Franklin declared. 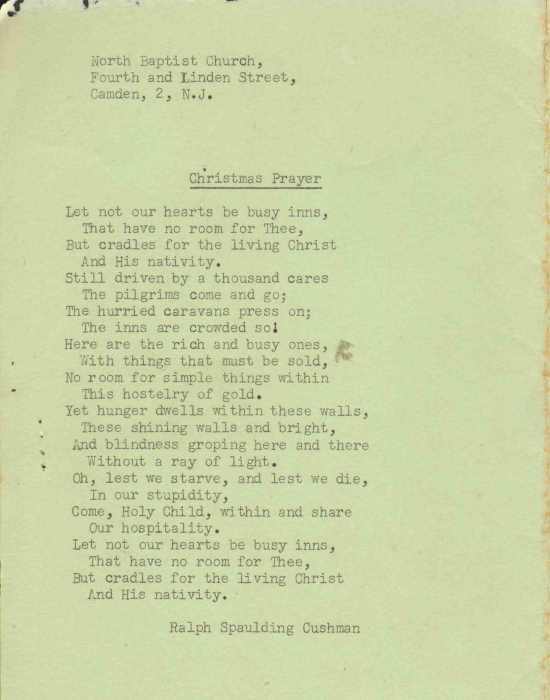 At this service there was music by the junior and senior choirs of the church. Celebration in the Bible School, also in the morning, was prefaced by greetings from Randolph Cramer, president of the Camden County Council of Religious Education. Mrs. Harold W. Bennett, wife of City Commissioner Bennett, spoke on missionary activities and exhibited curios from the Congo, Africa, where she was born. a daughter of missionary parents, and where a sister and a brother-in-law are now engaged in mission work Rev. 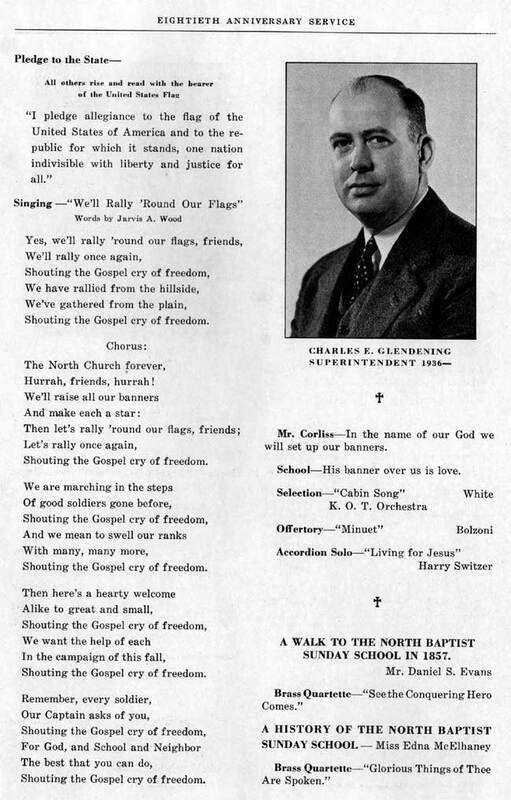 Chester A. Pennington was soloist and Miss Grace Hill violinist in a musical program. On Wednesday night 'the program includes a spiritual fellowship service, reception of new members and communion service. Rev. 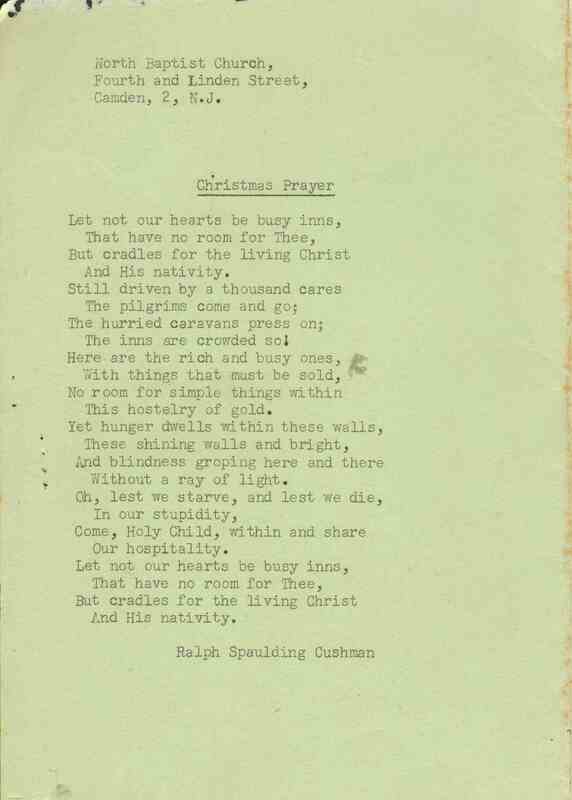 Walter S. Dunlop, North Church; Rev. 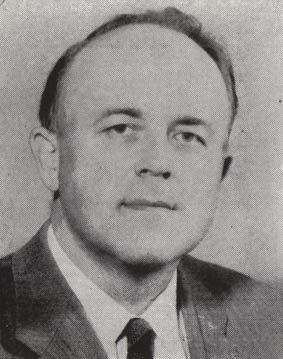 Walter L. Hunt, Tabernacle Church; Rev. Culbert G. Rutenber, Linden Church; Rev. 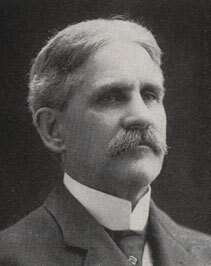 C. W. Dannenhower, Parkside Church; Rev. 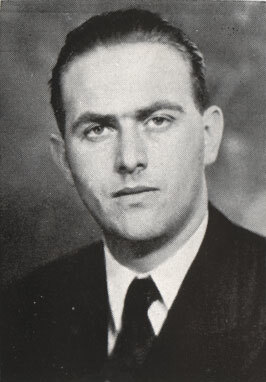 Antonio Galloppi, Italian Church; Rev. Paul Bramball, Laurel Springs Church; Rev. David J. Davis, Oaklyn Church, and Rev. Gilbert L. Guffin, Merchantville Church. 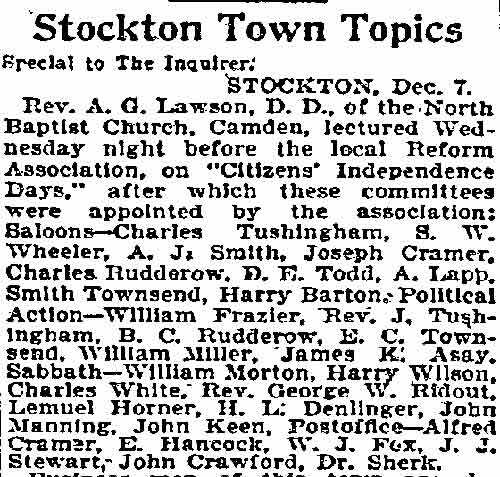 Officers of the CAMDEN NJ - First Baptist Church are Atlie M. Ward, president of board of trustees; F. Y. MacCullough, president board of deacons; Frank B. Gail, treasurer; Ida M. Subers, financial secretary; Howard H. Westcott, clerk; Raymond B. Heston, organist and director of choir and J. Alpheus V. Harker, Sunday School superintendent. An entertainment will be held in the assembly room of the North Baptist Church in Camden Thursday, February 24, at 8 p. m. The program is being sponsored by the Senior Bible Class of the Sunday school. 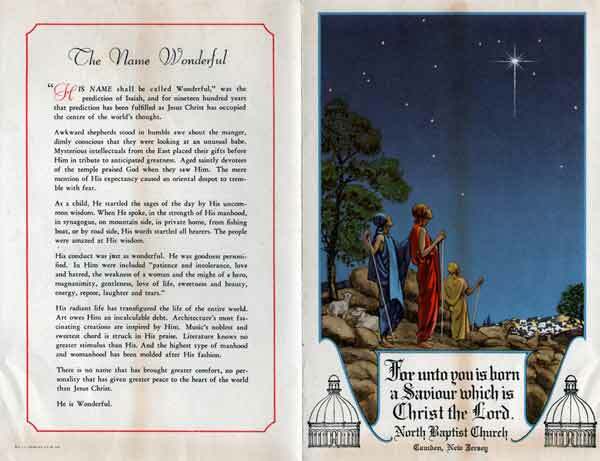 The entire evening's program will be given by Mrs. Ruth Welker Schwartz, reader, and Mrs. Winifred Langley, soloist, with the choir of the North Baptist Church. Mrs. Langley will be accompanied by Mrs. George Letts. There also will be a musical ensemble under the direction of Miss Mae Edwards. Mrs. Schwartz is well known to Camden county audiences. She has appeared before women's clubs, church organizations and Kiwanis clubs of many local communities.